In which I remember Tony Hart, children's television presenter of my youth. Don S Davis has passed away, aged 65, of a heart attack. He was best known for playing General Hammond in Stargate SG1. On behalf of his family and wife, Ruby, we thank you for your prayers and condolences. A family memorial where Don's ashes will be scattered in the ocean will take place in a few weeks, and should you wish to, please make a donation to the American Heart Association in Don's memory. Humphrey Lyttelton, a self-taught trumpet player, is one of the father figures of British jazz. He is the chairman of I'm Sorry I Haven't a Clue and presents The Best of British Jazz on Radio 2. He was educated at Eton and went to Camberwell Art School. On leaving school he worked briefly in a steel works in south Wales. In 1993 he won a Sony Gold Award for Services to Broadcasting. Humphrey has written several music books as well as his autobiography. He has worked as a music reviewer, written for Punch, been a cartoonist on The Daily Mail and a restaurant critic for Harpers and Queen. He is a great-grandfather and his favourite pastimes are bird-watching and calligraphy. In April 2000 he was honoured with a lifetime achievement award at the Post Office British Jazz Awards. It was only October last year that I saw 'clue', and I'm glad I took the opportunity. Humph isn’t likely to retire! It's been reported in the last couple of hours of so that the Crocodile Hunter, aka Steve Irwin, has died aged 44. He was filming a documentary and a stingray barb went through his chest. The incident happened on Monday morning Australian time. Stingrays do not normally attack aggressively, or even actively defend themselves and stingray deaths are rare. When threatened their primary reaction is to swim away. However, when they are attacked by predators or stepped on, the barbed stinger in their tail is mechanically whipped up, usually into the offending foot; it is also possible, although less likely, to be stung "accidentally" by brushing against the stinger. In order to commemorate Douglas Adams, today is Towel Day Happy Towel Day. Heard on the News tonight. 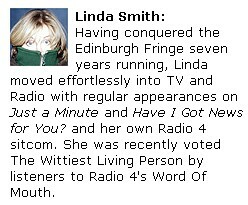 Linda Smith of 'The News Quiz' fame, died today from cancer. Linda's dry wit will be missed. The image below is a screengrab from the News Quiz website, made a few minutes ago. Andreas Katsulas, the actor who played both G'kar in the wonderful Babylon 5, as well as the One Armed Man in 'The Fugitive' film has died. He died on Monday of Lung Cancer. For those unfamiliar with the above references, Katsulas was one of the defining characters in Babylon 5. B5 started off looking pretty ordinary, even cheesy - however it began to layer it's plot and a story arc became visible - by the middle of season3 and 4 it was really firing on all cylinders. Katsulas' character underwent one of the biggest transformations, from simply an aggressive and domineering type, to a leader of an oppressed people, through to a man of peace and a religious icon. B5's story arc undergoes a similar big transformation (the president Clarke storyline is one of the best in my view). Season 5 of B5 is perhaps a bit weak - but the show was almost cancelled with season 4 and so they have to bring some things forward to make it work. This is posted about six months after the event, but a blog has just posted an eye-witness account of the Death of the much-missed John Peel in Peru. Just thought it may be of interest. So, the Pope is dead. After what seemed a distasteful age of the media saying, 'no, not dead yet'. There will be certain rituals to follow. The Pope was the first non-Italian pope in some 450 years, and 15 days from now the cardinals can sit to elect a new pope. I have it in my head that it would be nice to see an African Cardinal elected, though I doubt this will happen. I do hope that the new Pope is not Italian again. The rules for electing a new Pope vary slightly each time, each Pope makes modifications to the rules. As I understand it (I'm not catholic, or religious in any way), the cardinals must sit between 15 and 19 days time. There is an upper age limit on the cardinals that have a vote, and a maximum of 120 can sit. They sit behind closed doors and write the name of their nominee on a slip of paper. When each cardinal does this the votes are counted, should the number of votes differ from the number of cardinals the votes are immediately destroyed and the ballot is redone at once. Four ballots are done a day until a Pope is elected with a two thirds majority. When the ballot is counted, the papers are burned and a chemical added to make the smoke black or white. After a certain time has elapsed, the Cardinals will be able to change to simple majority voting should they not be able to come to a 2/3rd decision. Second Correction: Ballots are four times a day, but the papers are burned twice a day. The Palestinian Leader, Yasser Arafat, died in Paris a few hours ago. Arafat was chairman of the PLO, and for a long time was seen as a terrorist by the world. Not unreasonably as the PLO would hijack aircraft and a PLO faction was deemed responsible for the Munich Olympic attack. He was seen as a terrorist by some until his death. Indeed, in the current climate this was inevitable. Of course, in the Israel-Palestine situation there is plenty of blame to go around. The Israeli government are by no means innocent in their dealings with Palestinians, breaking various UN resolutions. This situation is a long history which can't be summed up in a few words. Given that the Sharon government has long had an entrenched anti-Arafat position, there is now an opportunity for some good to come from this and for Israel to move on in its negotiations without losing face by negotiating with Arafat. Tim Choate, who played Zathras in babylon 5 died in a motorbike accident four days ago. Richard Biggs, who played Doctor Stephen Franklin on Babylon 5, died earlier in the year. A shame. Bad things always happen to Zathras.